We often think of the impacts of extreme events, like the flooding in Houston or the damage from the earthquake this year in Mexico City, as resulting from some anomalous “Act of God” or natural hazard. Vulnerability researchers, however, know that the damage and loss experienced in any city is also the result of human decision-making and actions. Over years, decades and centuries, these decisions define the built environment and the vulnerability of urban residents to hazards. A team of ASU sustainability scientists and researchers at the National Autonomous University of Mexico (UNAM) pulled reviewed historians' accounts of 600 years of water-related hazards in Mexico City, from the time of the city’s founding in 1325 to the present. They documented how key decisions made by city leaders to control flooding or address water scarcity for the city’s residents evolved over time into new hazards, or exacerbated the very hazards they were aiming to manage. 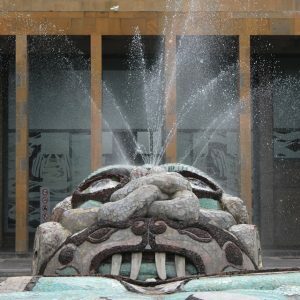 The team used colorful historical accounts of moments of crisis and investment in city infrastructure, such as the time when the lord of a village subjugated by the Aztec leader of Tenochitlán was beheaded after warning that the spring water Tenochitlán was coercively extracting through a new aqueduct would flood the city core. These demonstrated how historically-situated beliefs, management of knowledge and exertion of authority by city managers resulted in investments that proved problematic decades later. Efforts to pump groundwater to remove waste water from the city to avoid flooding has, paradoxically, exacerbated both problems. Subsidence from groundwater depletion enhances flood risk and ruptures water supply infrastructure, reducing the critical level of water pressure the city needs to supply its residents. As the city has moved to import water from neighboring watersheds to alleviate groundwater demand, new scarcity has emerged in these peripheral regions. Urban growth now means that these neighboring watersheds are part of the larger metropolitan region; the city will need to reach farther and farther afield in order to satiate the demand of the population that is now within its boundaries. Their team's findings, published in Ecology and Society, have some lessons for solving the sustainability challenges of the future. History demonstrates that the very best solutions today may present critical challenges for tomorrow, as well as that people collectively have far more agency in, and influence over, the complex systems we live in than is often acknowledged.